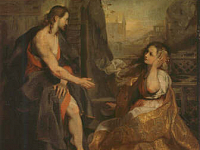 Painting during Italy’s Religious Counter Reformation, Barocci developed an influential style of painting and etching. One may even go as far to say that he was the most unique artist of his time in central Italy. He created true to the style of his time, Mannerism, but had a fresh approach in his use of dramatic lighting to conjure highly emotive spirituality. He also implored a unique sensitivity for capturing more life-like figures that are gently expressive in colors of warmth, but still emotionally riveting. 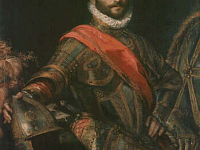 His work was a distinct precursor to the Baroque period of painting, especially on artists such as Flemish painter, Peter Paul Rubens (1577 – 1640). 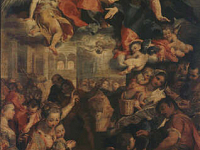 Barocci’s piece, Martyrdom of Saint Vitale was of great influence on Rubens’ Martyrdom of Saint Livinus. Barocci also influenced works of the Roman Sculptor Gian Lorenzo Bernini (1598 – 1680, notably his Baroque masterpiece in the Santa Maria della Vittoria, The Ecstasy of Saint Theresa. His earliest artistic training was with his father, Ambrogio Baroccio, who was a sculptor from a Milanese family. His uncle Bartolommeo Genga encouraged his full entry into a career as an artist. This led a young Barocci to an apprenticeship with Battista Franco Veneziano, called Il Semolei (1510 – 1561) in the city of Urbino. Other artists he trained under where Francesco Manzocchi and Taddeo Zuccari (1529 – 1566), and again under his uncle Genga. He studied many of the great artists closely, gaining influence from Titian (1485 – 1576), Raphael (1483 – 1520) and most notably Correggio (1489 – 1534). Sometimes collaborating with Federico Zuccari (1542 – 1609), the younger brother of Taddeo, he worked throughout the cities of Rome and Urbino between 1535 and a few years before his death in 1612. The artist’s most ambitious works are often noted as, The Deposition in the Duomo of Perugia (Cathedral of Perugia), Madonna del Popolo (Virgin of the People) in the Uffizi Gallery, and The Martyrdom of Saint Vitale. Of his other works in the Uffizi Gallery are his portraits of Francisco Il della Rovere and of Ippolito della Rovere, as well as Noli me Tangere (Christ and Mary Magdalen) and a Portrait of a Girl. His most regarded etchings are The Pardon of San Francesco and The Annunciation. Having several praised altarpieces and portraits, the artist also has over 2,000 documented drawings to his name. It is said, as mentioned by the Catholic Encyclopedia, that a group of jealous painters tried to poison Barocci at the height of his success. This is possibly the cause of the weakness he suffered in later years with a diminished creative output. Where the great biographer of Italy’s Renaissance, Giorgio Vasari, wrote that Barocci was, “…a young man of great expectation”, the biographer of the Baroque age, Gian Pietro Bellori (1613 – 1696), went on to consider him a master of the period.